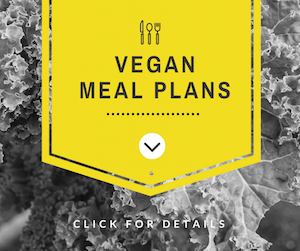 Interested in eating delicious vegan food, but having it be easy? Yeah, me too. That’s why I was thrilled to learn about Laura Theodore’s latest cookbook, Vegan-Ease: An Easy Guide to Enjoying a Plant-Based Diet. Laura Theodore is the definition of multi-talented. In addition to being a critically-acclaimed radio host, TV personality, chef, actress, jazz singer and songwriter, she’s also an award-winning author. Known as the Jazzy Vegetarian, Vegan-Ease is Laura’s third delicious plant-based cookbook. In it, you’ll find recipes that are inspired and soulful while also easy and recognizable, making it a great entry point for anyone exploring a vegan diet. Approachable for both cooks and diners, recipe ingredients in Vegan-Ease are readily available in traditional grocery stores. Each recipe has a numerical ‘Ease factor’ assigned to it, indicating ease of preparation. 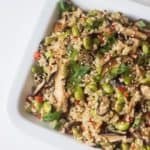 For example, the Maple-Banana Oat Muffins have an Ease Factor of 1 (easiest), while the Quinoa and Butternut Squash Paella has an Ease Factor of 3. (Keep in mind, those with a high ease factor still look plenty easy). Eaters will appreciate that recipes in Vegan-Ease feel familiar. Whether it’s Split Pea Soup, a hearty Spaghetti Dinner or Mexican Pizza, the cookbook offers straightforward recipes that happen to be plant-based. 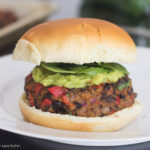 Sure to be a hit with both vegans and omnivores! Laura also includes guides to essential ingredients, shopping, cooking and nutrition that address common questions about a vegan lifestyle. Chef’s Notes throughout the book offer helpful recipe tips and variations. The Stress-Free Holiday Recipes chapter particularly resonates this time of year. Inventive recipes like Holiday Rosemary Smashed Potatoes and Chili-Maple Brussels Sprouts are lovely additions to a holiday table, but won’t keep you stuck in the kitchen all day. 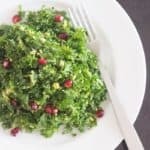 I’ve made several tasty recipes from Vegan-Ease. I adored the Zingy Roasted Asparagus deliciously spiced with chili powder. I also loved the Butternut Squash Soup with Cashew ‘Cream.’ Recipes are sufficiently detailed but clear-cut, meaning you can’t screw them up. And despite never making dessert, the Pumpkin Pie Cheeze-Cake (Ease Factor 3) lured me in. It was smooth and beautifully spiced. (You’ll find the recipe below). I look forward to bringing it to holiday gatherings this season. Fantastic with or without the Vegan Whipped Topping. With recipes that are convenient, but impressive enough for a celebration, check out Vegan-Ease: An Easy Guide to Enjoying a Plant-Based Diet. One lucky winner will receive an autographed copy of Vegan-Ease by Laura Theodore AND one of her CDs! To enter, simply click on the giveaway below to input your contact information and leave a comment on this post saying why you’d like Vegan-Ease. Good luck! The giveaway entry period begins 12:00am Oct 18, 2015 12:00am ET and ends Oct 25, 2015 12:00am ET. This giveaway is open to US residents only. One winner will be drawn at random and will be notified by email. The winner must respond within 48 hours with their mailing address to claim their prize. Otherwise, another winner will be selected at random. The winner will receive an autographed copy of Vegan-Ease by Laura Theodore and one of Laura’s CDs. The book will be shipped to the winner by the publisher. To make the crust, put 1¾ cups cookie crumbs and the melted margarine in a medium-sized bowl and mix with a fork until well combined. Pat the crumbs firmly into the bottom of the prepared pan. Bake the crust for 5 minutes. Remove from the oven and let cool 5 minutes. Your review on this book was great! I would love to win one, I have been vegan for almost 4 years and love to cook new things! I guess maybe I should say I love to TRY to cook new things, this cookbook looks like it it would be right up my alley!!! I’d like to win because I’m always looking for quick and easy vegan recipes. This Pumpkin Spice Cheeze-Cake sounds awesome! I love this time of year. I really miss seeing Laura on TV as my current PBS station doesn’t carry her Jazzy Vegetarian show. I’d love to win her cookbook so that I can cook with her even though I can’t watch her on TV. Thanks for the giveaway opportunity!! I’ve been a vegan for two years and am transitioning my kids towards it as well. Sounds like a great resource for speedy meals with a familiar palette. Perfect for this! I already own Vegan-Ease and I have enjoyed many tasty meals from the cookbook. If I were to win an extra copy I would give the cookbook to my sister as a gift. We are both trying to eat healthier meals and shed pounds in the process. I think she would enjoy having the cookbook and I I know her kids would love the meals as well. count me in! 🙂 I am slowly trying to transition to vegan from vegetarian and bring my family from omnivores to vegetarians. thanks for the pumpkin pie recipe! sounds delicious. i made silken tofu chocolate mousse for my family and they loved it. one question : why does the pie only keep for two days when a traditional one is good for about five? thank you! Thanks for the change to get this awesomeness of a cookbook and learning tool. I have to go vegan for health and can use all the help I can get. I have the Jazzy Vegetarian Classics cookbook & love it. Laura’s recipes are delicious so I would love to try recipes from her new cookbook. That quinoa squash paella sounds amazing! I watch The Jazzy Vegetarian every week. All of Laura’s recipes look delicious. I’d love to have this book because I can always use more easy, tasty, healthy dishes in my repertoire. I would love to win, I am always looking for easy recipes as I don’t have a lot of time or energy to cook these days. I’ve watched her on PBS and I like to grow my cookbook collection! I would LOVE to win this book!!! My hubby and I are just starting out as Vegans. There’s so much to learn and the more I learn, makes me more satisfied about our decisions. I need to increase my very small arsenal of recipes. Your book would help with that.